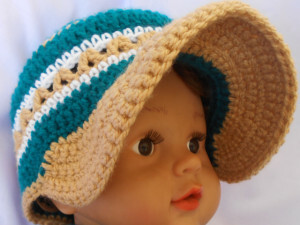 I totally adore the huge brim on this baby hat. It’s stylish and sure to keep the sun out of your baby’s eyes. The pattern recommends a worsted weight yarn in three colors and a 3mm crochet hook. If you enjoyed this free crochet pattern you might also enjoy more designs by Crochet/Crosia Home.